Bio Skin® Performance Supports reduce muscle vibration during running and jumping activities, so you get the most out of your muscles. Constructed of Bio Skin® 2sL™ material. 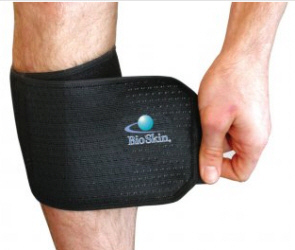 Shin Splint Wrap with Pad is 5 inches in height. Fits Left or Right Calf. Bio Skin® should be applied to dry skin. Oils, lotions and perspiration will make the support harder to put on and will make it will feel as if it's sized too small. Dry the area of application before applying support. Take the support with both hands and stretch the top and bottom of the support two to three times. This helps to relax the material before its gets broken-in. 1. Place sewn-in pad (end opposite the label) over painful area on the front of the shin. 2. While holding the pad end in place, wrap the support around the leg and secure the first hook strip onto the wrap. 3. Continue wrapping and tension the wrap to comfort and fasten end to secure.